How Should the Fast and Furious Franchise Evolve from Here? The family has to retire eventually, right? Alright, let’s not beat around the bush. The first Fast and Furious movie wasn’t exactly well thought out. At the time, Vin Diesel was just getting to be known, and the most popular name in the whole film was arguably Ja Rule, who is still probably kicking himself in the nuts for turning down a role in the second film. How many gears did those cars have in the drag racing scenes? It was certainly more than the five or six that they should have had, that’s for sure. And, I still can’t get past that floor pan falling out of Brian’s Eclipse during the first big race. Then we had 2 Fast 2 Furious, which at least tied into Brain’s story, but was followed up by Tokyo Drift. Now, Tokyo Drift was a decent movie with plenty of action and some interesting race scenes, but it was completely void of the main character(s) in the franchise. Finally, things turned around for the franchise with the fourth installment, bringing the group back together. Eventually, we ended up with movies that showcase a sense of family and never giving up on them – all the way up to the most recent film when Dom ends up turning his back on his family altogether. Foe have become friends, and friends have become foe. The family has wreaked havoc to the tune of an estimated $514 million over the course of eight films. What started out as a B-movie has turned into some pretty intense and highly successful films. With Dwayne Johnson and Vin Diesel reportedly feuding during the filming of Fate of the Furious, and Brian O’Conner officially out of the mix, where should the franchise go? 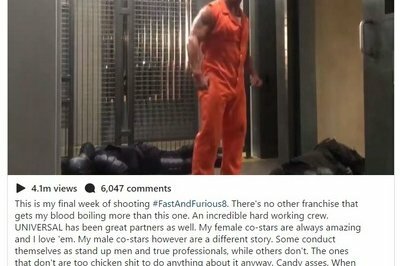 A while back, before we even saw and teasers or trailers for Fate of the Furious, Vin Diesel and Dwayne Johnson were having quite the dramafest with Johnson even venting a bit about it on Instagram as you see in the image above. It was a hint that things weren’t all gravy within the F&F family, and it led to some serious doubts about whether or not the franchise would even be able to continue. The movies are full of stars, but Dwayne Johnson and Vin Diesel sit at the top of the food chain. You add that to the uncertainty that began to swirl after Paul Walker’s untimely death, and you have an explosive element that could, in fact, bring an end to this long-running franchise that ultimately proved that sequels can, in fact, be better than the movies that came before them. With two new movies in the pipeline, which will extend the number of installments in this franchise to 10 (boy, that’s going to be an expensive box set, right?) there’s no telling what can really happen or if these new movies will even come to be. Well, Fate of the Furious turned out to be very successful, beating out Star Wars: The Force Awakens over the opening weekend. Its record-breaking earnings can be attributed to it opening in China at the same time, but even still, it earned a lot more than some people were expecting. Now that the initial hype has burned out from the initial movie debut, word is starting to circulate about the drama between Johnson and Diesel, and for once it isn’t all bad. Several sources are indicating that the Rock and Diesel have squashed their squabbles and are both said to be onboard for installment No. 9, which is expected to hit theaters in 2019. Word has it that the two actors were feuding over “Real Estate,” which in Hollywood terms means who gets the hottest girl, who gets the most screen time, who sees the best action scenes, and who gets to show off their bodies more – yeah, that’s really a problem in Hollywood. In the end, the two have apparently squashed all the drama. After all, Vin Diesel is listed No. 1 on the call sheet, and both actors make boatloads of cheddar from each movie. The Next Move... Will the Fam Stick Together? So, now that we’ve heard the drama between Johnson and Diesel is squashed and know the films can be successful without the late Paul Walker, where does the franchise go from here? Obviously, the future films will have a strong sense of family and bromance, but what else can the team really do that they haven’t done already? Will the franchise go back to its roots and focus more on street racing than organized crime and the usual mercenary-like work? After all, a group of street racers became a team of the baddest mothers on the planet, taking on small armies and conducting revenge. At what point to they count their blessings and ultimately retire for real? It’s hard to really say, but something tells me there’s still a couple of good movies left in the franchise before it goes bust. That’s assuming, of course, the actors continue to get along, and the money keeps coming in. The world loves the F&F family because it gives us a sense of family values and loyalty that’s becoming increasingly rare these days. It also shows us that enemies can become friends when there’s a common goal in the middle. Maybe these few things are why I hope the franchise carries on. 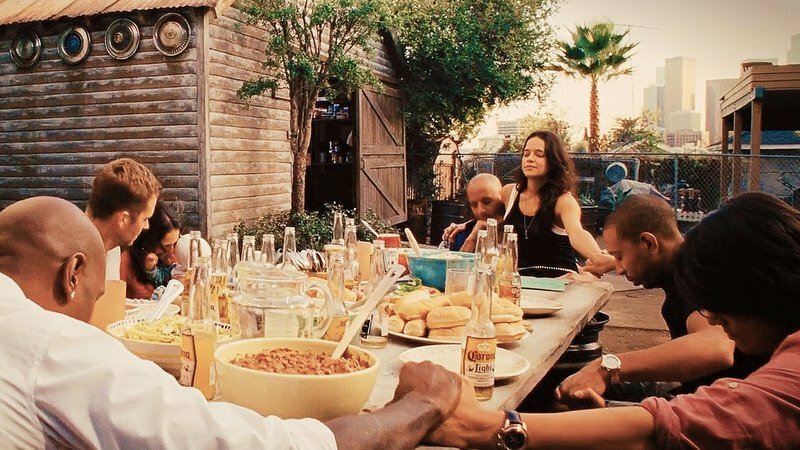 Sure, the action scenes are great, and I love the cars, but that sense of family and loyalty is something else. The world seems to have mixed opinions about the franchise, though, so what do you think? Should the franchise call it good right now and leave things as they are? Should they use the next two movies to tie up loose ends and give the family a happy ending? Or, do you want to see at least five more movies of action-packed, high-octane destruction? Let us know in the comments section below.